I recently received Treasuring Emma by Kathleen Fuller for review. This story focuses on Emma and the family around her. They all have to come to grips with death in the family, lost love, and even loss of property. One of the greatest thing they all have to learn is that they are not in charge, but rather that God provides and has a greater plan. This is a well woven piece of Amish fiction. What I really enjoyed about this book is that the characters are not always proper and perfect. So many times Amish fiction eludes to that type of character and it ends up being a good read, but very predictable. This novel had enough real feelings that it was not always so easy to guess what might happen. If you'd like an easy read that's entertaining, this is a great choice! 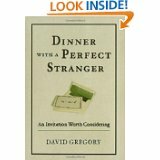 I also read Dinner With a Perfect Stranger by David Gregory. This is a story of a man that has little time, loads of skepticism, and receives an invitation from Jesus to go to dinner. Thinking that his friends were playing a trick on him, he goes to dinner only to find that it was no trick at all. This is a gift-sized book and a very quick read with about 100 pages. I was really anticipating reading this book. I read it for Blogging for Books for an honest review, though, so that is what I will give you. There were several pages in this book that spent time disproving religions other than Christianity. Although I am a Christian, I did not appreciate that about this book, and I could understand how my friends of other faiths would be put off by this reading. If I were having dinner with Jesus, I would not want to a theological discussion, but rather I would want to talk to him about his life, my family's life, and some (well many) Scriptures that I have questions about. It wasn't until the very last pages that some of these things were touched upon. I didn't understand many things about this book, and I guess in the end, I wondered whether or not I would believe that was Jesus sitting across from me. With that being said, I have to point out that faith is a very personal journey. I pretty sure we all have different questions we'd like to ask Jesus. While I am sure there are some that would love this book, it just didn't fit for me.